Ever since I first started taking note of what happened on the 8000m peaks, Cho Oyu (8201m), the sixth highest mountain in the world, has stood out as the one that is most achievable for amateur and guided mountaineers to climb. Despite this, even the best mountaineers have had difficulties climbing it, and two of the early expeditions there experienced contrasting fortunes. Arguably it was the first 8000er to be climbed by a fully commercial expedition team. The amusingly-named Austrian Marcus Schmuck, who made the first ascent of 8047m Broad Peak in 1957, led an international team of commercial clients there in 1987. The expedition was very successful, with thirteen climbers of five different nationalities reaching the summit. By 2012 Cho Oyu had seen over 3000 ascents, more than three times as many as any of the other 8000ers apart from Everest (Everest has now seen around 7000 ascents). Cho Oyu also saw one of the quirkiest first ascents, completed almost in alpine style by a team of rank amateurs. The first serious proposal to climb it came in 1952, when the British sent a strong team led Eric Shipton, which included Edmund Hillary. This expedition was a precursor to the British ascent of Everest the following year. By 1952 Shipton had acquired the reputation of a great mountain explorer but a conservative climber, more intent on mapping new territory than reaching summits. By contrast Hillary was determined to make a name for himself with first ascents. The team had explored the south Nepalese side of Cho Oyu thoroughly in 1951, and concluded the best means of ascent had to be from the north side in Tibet. They found this route in 1952 when they trekked north from Namche Bazaar and crossed the Nangpa La pass, the ancient trade route between Tibet and Nepal. A little below the pass on the northern side Cho Oyu presents itself as a giant dome of snow. 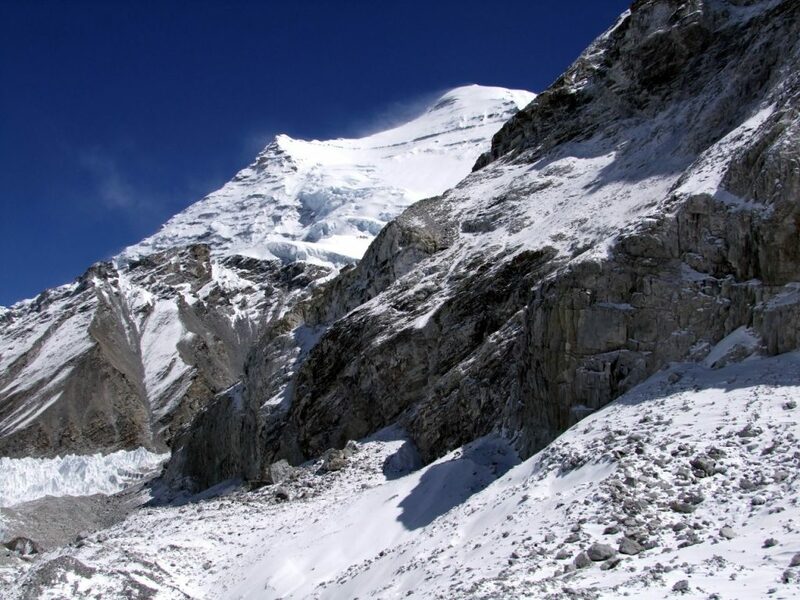 They were looking at the North-West Face, which has now become Cho Oyu’s standard route. Hillary and his New Zealand compatriot George Lowe were keen to climb it, but Shipton was mindful of the fact that they were trespassing into newly-acquired Chinese territory (China occupied Tibet in 1950). 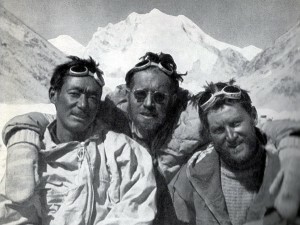 Shipton was worried that if they became embroiled in a border dispute with the Chinese, the Nepalese government might be pressured to respond by withdrawing the British permit for Everest the following year. Hillary also thought the North-West Face (now Cho Oyu’s standard route) looked daunting. Here’s his description of first seeing it. Shipton agreed to a compromise solution. Instead of laying siege to the mountain in traditional expedition style, he gave his consent for Hillary to make a “lightweight” attempt. This lightweight attempt involved six climbers and eighteen laden Sherpas (I guess they must have left the crates of champagne and stuffed quails at base camp). Despite the numbers it was a slightly ill-prepared attempt. They were constantly worried about Chinese officials appearing below and cutting off their retreat. Hillary complained that they were not fully acclimatised. When they reached the ice cliffs he had identified from below as the crux, he said they looked “hundreds of feet high and quite unclimbable”. They made a half-hearted attempt to find a route up the ice cliffs before retreating back down the mountain and across the border. These ice cliffs, at around 6,800m at the top of the twisting ridge Hillary described, have changed somewhat since his day. They are clearly no longer such a daunting proposition. But they wouldn’t have changed too much by 1954, when Tichy’s Austrian team arrived beneath them. 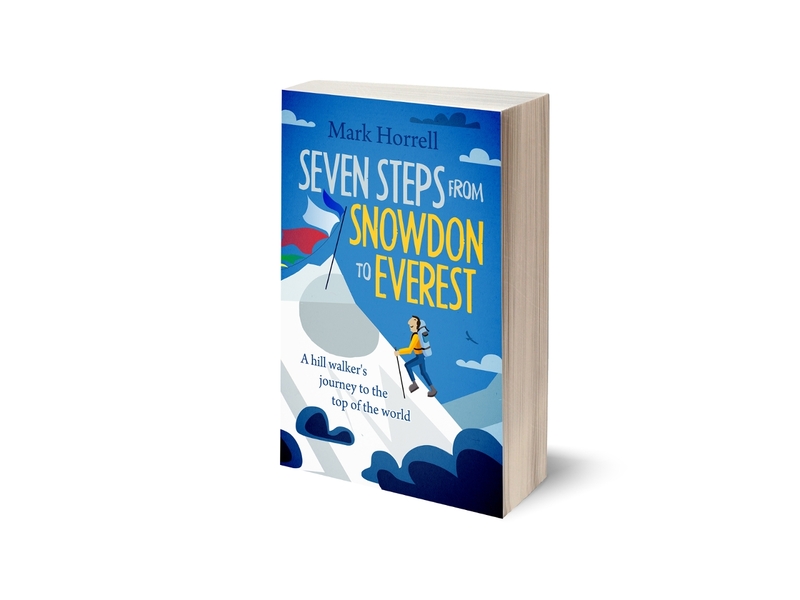 For Shipton and the British, Everest was everything and Cho Oyu was just an incidental aside. For thirty years Everest had been their mountain, with no opportunity for anyone of another nationality to climb it. With the opening up of Nepal to foreigners in the late 1940s all that changed. The British enjoyed no special diplomatic relationship with Nepal like they had with Tibet, and they were shocked when the Nepalese government granted the 1952 permit to climb Everest to a Swiss team instead of them. Even worse, the 1954 permit had been granted to the French. Shipton knew that 1953 represented the last opportunity for the British to make the first ascent of Everest, and he was right not to jeopardise their permit by having a cheeky tilt at Cho Oyu. The Austrian geologist Herbert Tichy had no such qualms. He had travelled extensively in Tibet in the 1930s carrying out field work, and after a short and enjoyable climbing holiday in Nepal in 1953 he applied and was granted permission to climb Cho Oyu the following year. He knew the best chance of success lay on the Tibetan side, and like Shipton, he was concerned about sneaking over the Nangpa La. But he had much less to lose and he agreed with Hillary that discovery was unlikely. In autumn 1954 he set out with his two friends Sepp Jöchler and Helmut Heuberger, and seven Sherpas led by sirdar Pasang Dawa Lama. 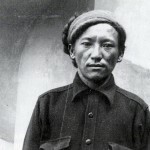 Pasang was a legend among Sherpas, who had nearly reached the summit of K2 with an American expedition in 1939. 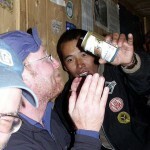 He is very much the star of Tichy’s book about the climb and was one of my ten great Sherpa mountaineers. They made good progress, and when they reached the ice cliffs that had thwarted Hillary’s team late one afternoon, Tichy intended to set up camp and start their assault the following day. But Pasang was keen to crack on, and he set off up them with the rest of the team in pursuit. Barely an hour later they stood at the top, with Pasang still in the lead. The Austrians’ success in climbing the barrier that had thwarted Hillary was in part due to their novel use of frozen urine, which they used to anchor ropes in the soft snow. Hillary was known to be a master of the one-liner, but the story of him reacting to this news by saying Tichy must have been “taking the piss” is apocryphal. 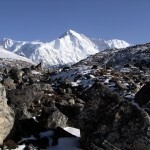 Tichy and three Sherpas established a camp above the ice cliffs at 7000m, intending to strike for the summit from there. But then disaster struck. They were about to leave camp when a fierce wind welled up and flattened their tents. In a desperate bid to stop one of them blowing away Tichy dived on top of it and buried his gloveless hands in the snow. Within seconds his hands were frostbitten, and he had no choice but to descend with the Sherpas. Back at base camp there was more bad news when he bumped into a team of Swiss climbers led by Raymond Lambert, the man who had nearly denied the British the first ascent of Everest by climbing it in 1952. With him was Claude Kogan, a pioneering female mountaineer who was hoping to become the first woman to climb an 8000m peak (she was to die in an avalanche on Cho Oyu five years later). The Swiss had no permit and asked Tichy if they could join forces, but the Austrians were appalled and said no. They realised that if they wanted to be the first to climb Cho Oyu they would have to go back up immediately, allowing Tichy no time to recover from his frostbite. To make matters worse Pasang, their star performer, was back across the Nangpa La in Namche Bazaar procuring fresh supplies. He caught up with them at their 7000m camp while the Swiss were fixing ropes of their own on the ice cliffs just below. Tichy, Jöchler and Pasang left camp at six o’clock the following morning, 19 October, and reached the summit at three o’clock that afternoon. They found a summit plateau big enough for a team of giants to play football on. Pasang had ascended over 4000m in three days, but it wasn’t until they returned across the Nangpa La into the Sherpa heartland of the Khumbu that the Austrians found out why he had been so determined to reach the summit. While resupplying back in Namche a few days earlier he had been promised a bride whose father had agreed to waive her dowry if he climbed Cho Oyu. 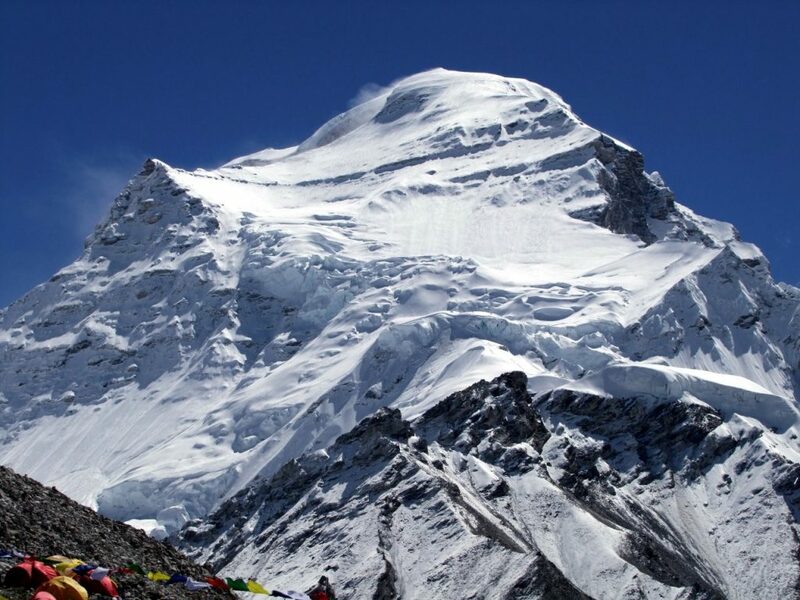 Comparing Hillary’s and Tichy’s ascents of Cho Oyu from a 21st century perspective, is like comparing a lumbering mega-corporation, weighed down by people and procedures, with an internet startup, lean and adaptable. Hillary’s team of very experienced climbers was supposed to be lightweight, but it wasn’t. They were super cautious and used to the old ways of doing things. By contrast Tichy’s team was inexperienced, but this gave them freedom. They were driven by one man, Pasang, who didn’t care about protocol and did things his own way. Tichy was the enlightened leader, happy to put his faith in a talented team member. There was also a bonus discovery. It was in the aftermath of Pasang’s marriage celebrations that Tichy discovered an unusual cure for frostbite that I have described in a previous post. What a great and interesting read Mark! I already knew about the British attempt on Cho Oyu but very little about the Austrians’ success. So thank you for the quick history lesson. Yes, Tichy was astounded when they were able to overcome in one afternoon a hurdle the British said it would take two weeks to get through. It’s pretty clear that Pasang, whose skills Hillary had downplayed in 1951, was the key to the whole ascent. Thanks for all that – more about Cho Oyu to come in my book “Only Two For Everest” (Otago University Press) being released this October. I was interested in the comment about the 1st commercial expedition to an 8000. Looks like there were some before. First one I found is from 1983, Germans on Manaslu. And there are some previous on lower peaks. Where do you find the difference between these expeditions and the Marcus Schmuck one? 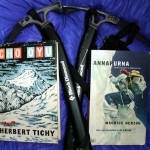 I don’t know anything about the German expedition to Manaslu in 1983. If you have more detail I would be happy to hear it. Of course, there were many commercial expeditions to peaks lower than 8000m long before. Marcus Schmuck himself organised one to Peak Lenin in 1974, which I talked about here: https://www.markhorrell.com/blog/2015/sunshine-and-optimism-in-the-high-pamirs-my-attempt-on-peak-lenin/. The first one was arguably Saussure’s to Mont Blanc in 1787: https://www.markhorrell.com/blog/2012/the-great-great-grandfather-of-mountaineering/. Hi Mark, as appears on AAJ 1982 “Manaslu, Northeast Face. Thirteen members of the commercial Hauser Exkursionen International reached the summit of Manaslu (8156 meters, 26,760 feet). The leader was the Swiss Hans von Känel, who climbed his fifth 8000-meter peak. The summit was reached on May 7 by von Känel, Jürgen Mecke, German, and Wanchu Sherpa, on May 11 by Fredy Graf, Hansjürg Müller, Swiss, Karl Horn, Andreas Loferer and Hans Zebrowski, Germans and on May 19 by Walter Heimbach, Rüdiger Schleypen, Germans, Josef Millinger, Peter Wörgötter, Austrians, Stefan Wörner, Peter Weber, Swiss and Pasang Sherpa. Six made it to the top without oxygen. Loferer was 62 years old. Wörgötter and Millinger made the descent on skis.” Rgds. Great comment, Marcelo. I’ll check out the report on the AAJ site. That’s an impressive feat. Manaslu was only really considered as a commercial peak in 2008, a year when the Chinese didn’t grant permits for Cho Oyu, so many teams switched peaks. To hear that someone took a commercial group up there such a long time before is very interesting. Absolutely. In any case the expeditions were commercials but organized by clubs. Different than current expeditions where there are organized companies doing so. It will be interesting to understand if these expeditions were open to anyone or just for club members. Rgds.